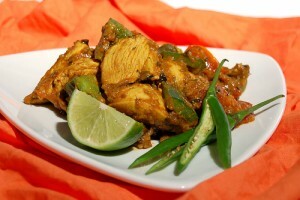 Chicken Jhal Frezi recipe by Ameera Alfalasi at DesiRecipes.com. 1. Heat the oil in a medium or large skillet over medhigh heat. 2. Add the onions and sautee 2 minutes, add garlic and sautee 2 more minutes. 3. add the chicken , ground tumeric, chili powder and salt . 4. Fry for 5 minutes constantly stirring everything (if using a nonstick pan, scrape bottom as you stir). 5. Add the can of tomatoes, bring to boil, cover and simmer on medlow to low heat for 10 minutes. 6. Add ground cumin, curry powder, ground coriander ginger , and the optional green chilis, stir, cover again and simmer for another 10 minutes. 7. Remove cover, raise heat to to medium to evaporate some of the excess liquid, 7-8 minutes. 8. Add the butter/ghee , and cilantro, simmer on low heat 5-7 minutes and enjoy with chapati, roti, naan, or even pita bread! !